Do you know if you're drinking contaminated water? Do you worry about drinking the water that comes out of your tap? Well, ya should be. Because, according to a 2017 report by the National Resource Defense Council, 77 million Americans get their tap water from community water systems that had one or more drinking water safety violations in 2015. That means one in four Americans is drinking water that doesn’t meet Safe Drinking Water Act standards. In fact, 267 toxins were found in U.S. drinking water systems between 2010-2015, according to an Environmental Working Group 2017 report. The offenses ranged from high levels of arsenic and disinfection byproducts, to nitrate contamination. The five states with the most violations were Texas, Florida, Pennsylvania, New Jersey and Georgia. If your water comes from a well, you also need to read this article. 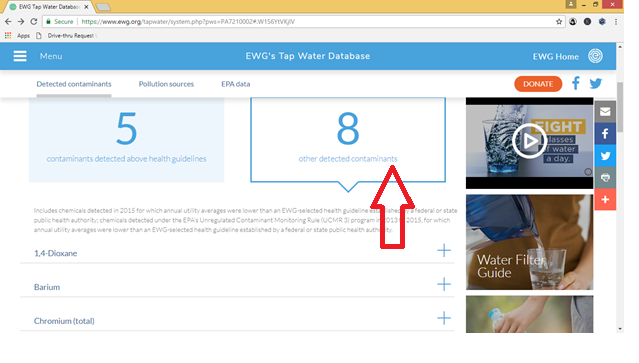 You'll learn a lot about what could be in your water by learning about the water contaminants that are detected by the public water systems in your area. 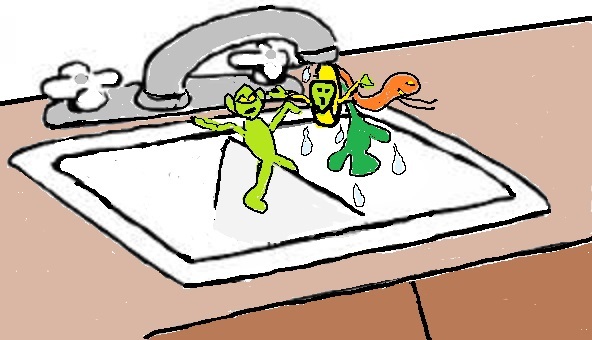 Finding out the contaminates in your drinking water is important because you need water to survive. And you need clean water to stay healthy. So take 30 minutes out of your day to go through the steps listed here to find out if you're drinking contaminated water. It will be the best 30 minutes you ever spent to protect your health. Because, when it comes to toxic chemicals, regular exposure to even low levels can affect your health. And since you drink from the same taps every day, you're exposed to the same, possibly contaminated, water every day. And everything from sunscreen chemicals to pills, pesticides and phthalates may be in your tap water. 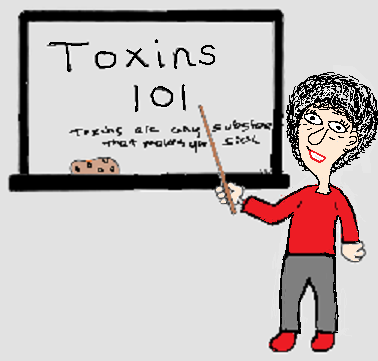 The types of toxins found in water are the result of a variety of factors, like where you live, weather events, nearby industries and agriculture and even the type of soil. Here is a partial list of common tap water contaminants and their health effects. 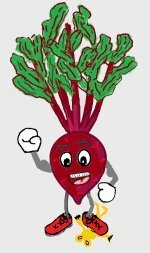 Haloacetic Acids - liver, kidney, central nervous system problems, bladder cancer. Lead - damage to brain, kidneys, bone marrow and nervous system. Nitrates - bladder, colon, kidney, ovarian cancer, one of top 5 carcinogens in water. 1,4-Dioxane - one of the top 5 carcinogens in water. Trihalomethanes - one of the top 5 carcinogens in water. 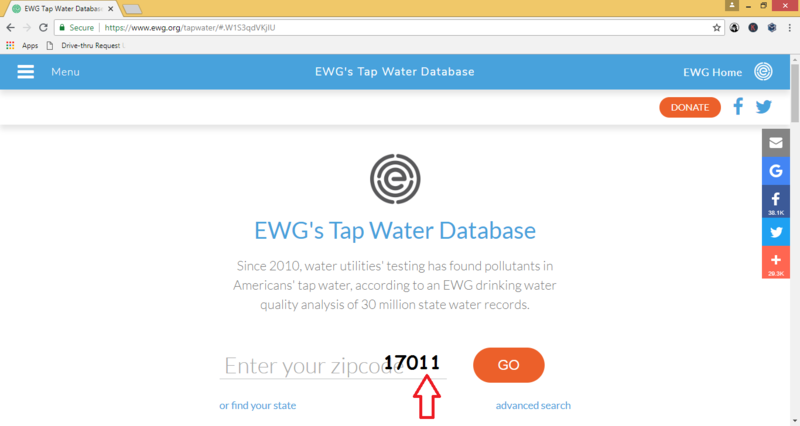 The first step to finding out if you're drinking contaminated water is to go to the Environmental Working Group Tap Water Database. You'll find info here on the water treatment companies that provide water to homes in your area. 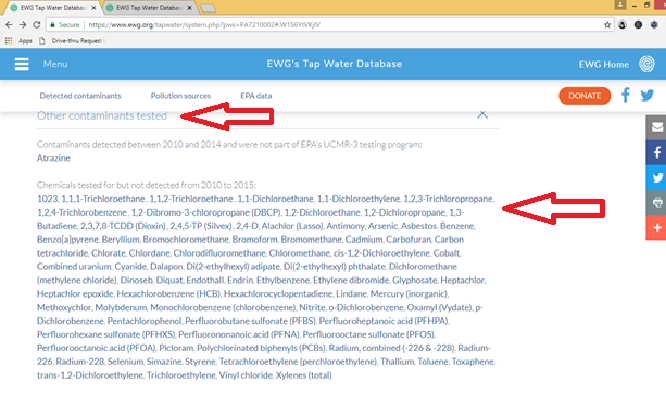 The database also has info on the chemicals detected in your area's water from 2011-2015. And it shows how many quarters per year water companies were in violation. That means chemical levels in tap water were too high. So click on this link and type in your zip code. 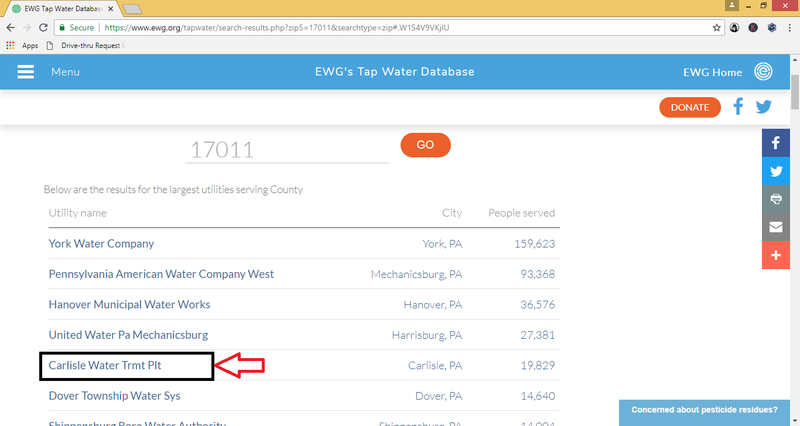 After you enter your zip code you'll see a list of water treatment companies that supply drinking water in your area. Click on your supplier. If you have a well, choose the water company closest to your home. 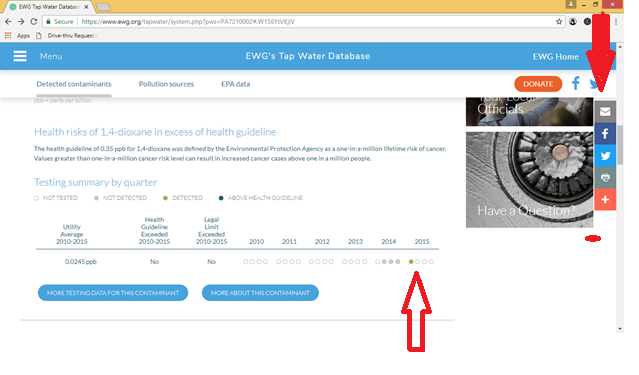 After you click on your water company you'll see a page with the number of chemicals that showed up in your water at unsafe levels. In this example there were 5. Below the number you'll find the list of chemicals. 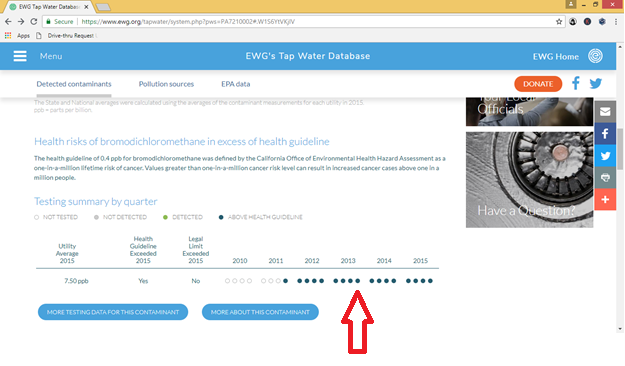 Click on the first chemical to see how often it shows up in your water at unsafe levels. In this example the first chemical is bromodichloromethane. Bromodichloromethane is a byproduct of the disinfection process. That means it's created and ends up in your tap water during the disinfection and cleaning of the source water that will eventually come out of your tap. Below the information on the contaminant you'll see how the levels in your area compare to the levels state and nationwide. 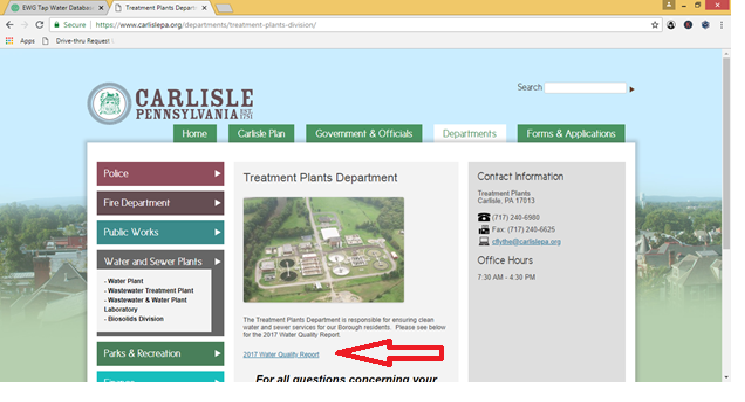 The bottom arrow is pointing to the levels found in tap water from the Carlisle Treatment plant. The level is way above state and national levels at 750 ppb (parts per billion). Bromodichloromethane is part of a group of disinfection byproducts called trihalomethanes. Exposure to trihalomethanes in drinking water has been linked to liver, kidney or central nervous system problems, and to increased risk of bladder cancer. 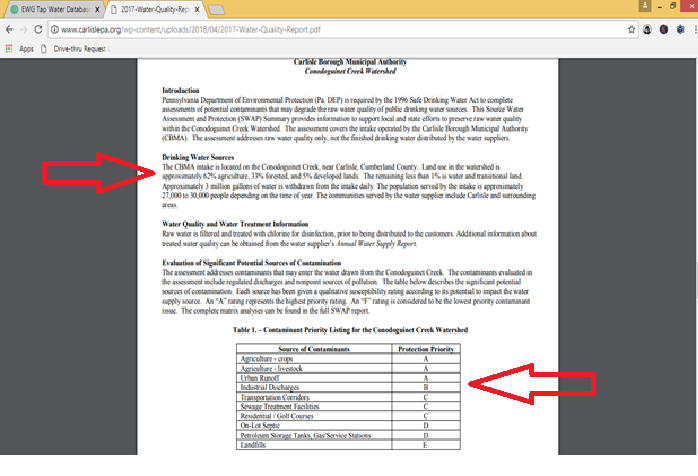 Scroll down to find out how often your water company exceeded the limit for this contaminant. Testing is done once every 3 months. You can see from the graph that levels were too high for every quarter from the end of 2011 through 2015. Go through each of the chemicals that were detected and make a list. The list will help you find a water filter that removes these chemicals. Next, click on the right-hand list of chemicals that were also detected, but at levels below health guidelines. Remember, health and EPA guidelines are usually inadequate for protecting your health. So you'll also want to read about and make a list of these contaminants. In this example the first contaminant is 1,4-Dioxane. And for this treatment plant the detection level was below state and national averages. But it is a carcinogen so any level is unacceptable. Scroll down the page to see how often it's been detected. You can see from this example that it's been detected in 4 quarters since 2010. Go through each of the chemicals that were detected and add them to your list. 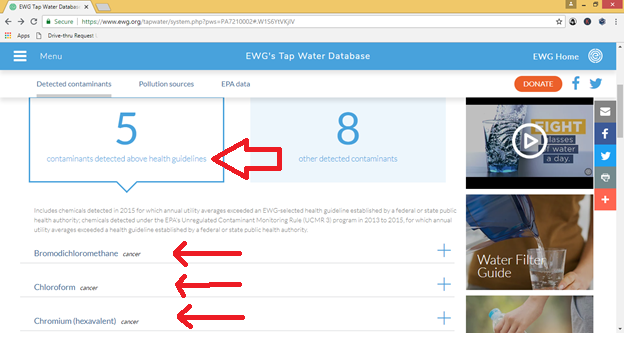 Scroll down to the bottom of the page and click on “Other Contaminants Tested” to see a list of contaminants that were tested for but not found in your drinking water. 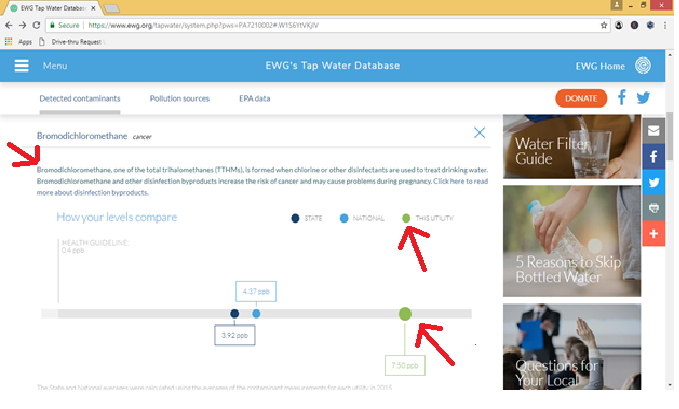 You now how information on the contaminants found in your water through 2015. If you want more updated info you'll have to visit the website of your water supplier and download the annual report. (If you're happy with the info you have, you can skip this part and move to the Finding The Best Water Filter section. Contaminant – Refers to the particular substance being analyzed in the water, such as lead. ***The MCLs are set by the state and the EPA. They are usually set too high to protect your health. So no violation doesn't mean health guidelines are met. You can also find out the source of your drinking water. In this example it is the Conodoguinet Creek. The report also identifies the main sources of water contaminants. In this example they are from agricultural crops and livestock and urban runoff. After completing these steps you now know if you're drinking contaminated water. If you are, there is something you can do about it to protect your health. But the solution isn't to drink bottled water. 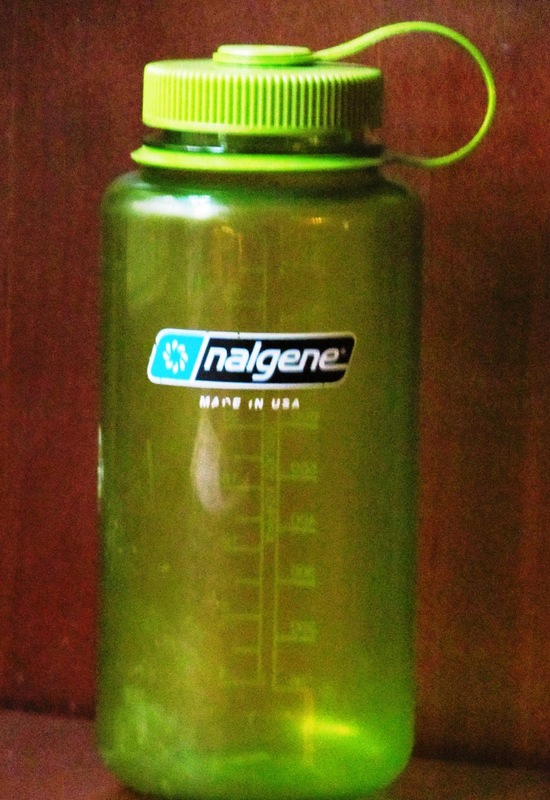 Plastic water bottles leach several types of endocrine disrupting chemicals into your water. And sometimes bottled water is just glorified tap water. So the best next step is to decide what type of filter you want to clean up your contaminated water. Then, once you decide on the type of filter, you can identify the specific brand that will remove the contaminants in your water. Pros - cheap, easy to maintain, no plumbing required. The best ones remove at least 60 contaminants. Cons - have to remember to fill the pitcher, inconvenient for large families. Pros - no plumbing required. The best ones remove most contaminants. Cons - expensive, difficult to maintain, have to remember to fill and run the distiller. Need to re-mineralize drinking water. Pros - cheaper than whole house, easy to maintain, no plumbing required. The best ones remove from 60-70 contaminants. Pros - cheaper than whole house, convenient, most are easy to install with a few tools. Cons - takes up storage space. Some types may be difficult to install. Pros - provides constant supply of clean water to all faucets. Won't have to bath in chlorinated water. Cons - the best type, the mixed media system, is expensive to install. Reserve osmosis systems waste water and remove important minerals from your water. There's a hard way and an easier way to find the right filter. 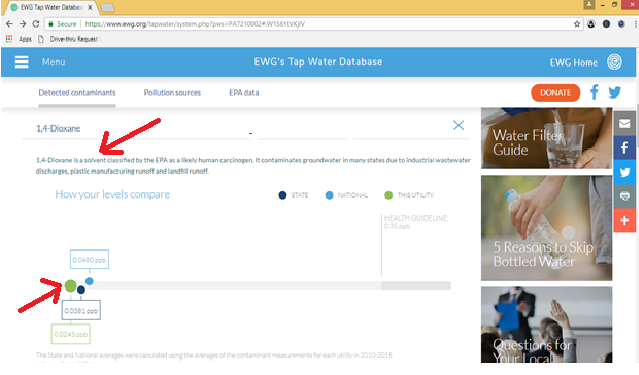 The hard way is to visit the NSF International Website's Contaminant Reduction Claims Guide. 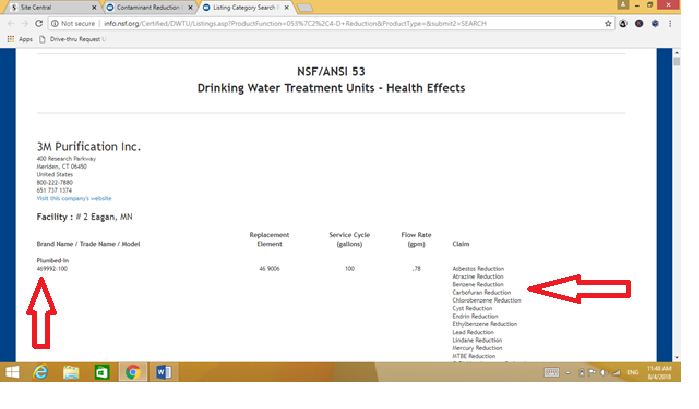 The NSF tests water filters and certifies the types of contaminants they actually remove. This isn't a blanket certification. Filters are certified for the removal of specific chemicals, from one to many types of contaminants. What that means is you want to make sure that the filter you choose has been tested and shown to remove the contaminants in your water. 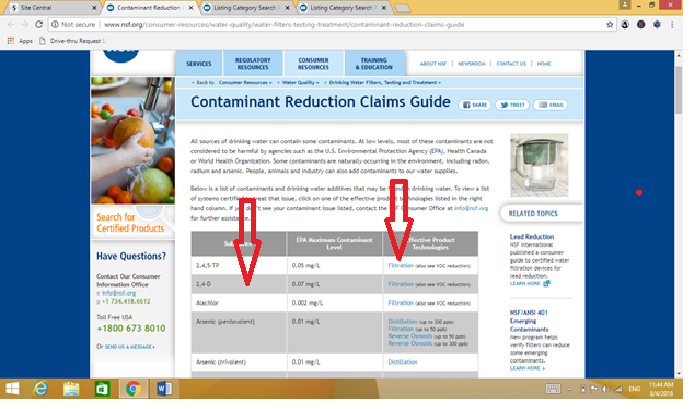 On the first page of the Reduction Claims Guide you'll find a list of contaminants in the first column and links to filters that remove them in the third column. Sounds easy enough. But look at the next screen shot to see what happens when you click on one of the links. 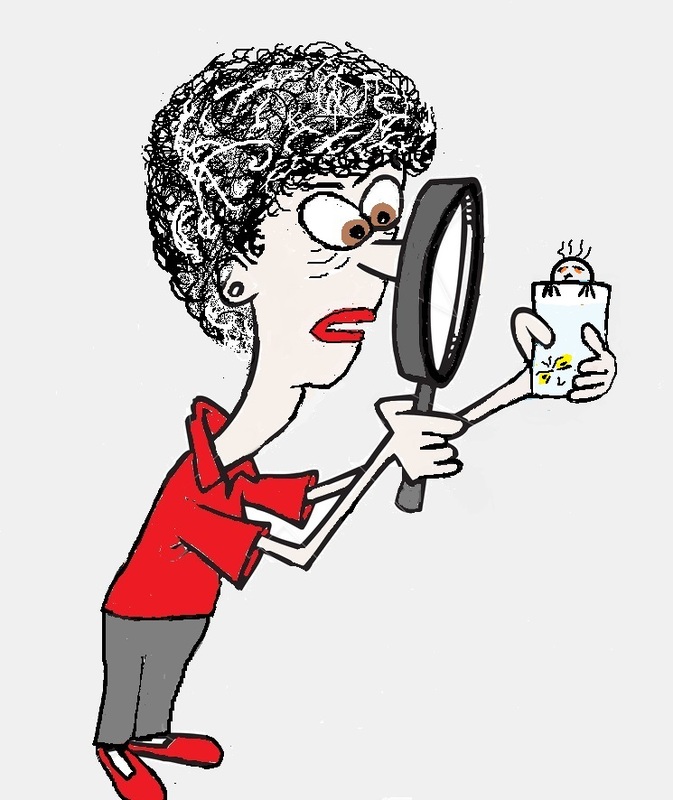 Unfortunately, once you click on a contaminant, you’re faced with a long list of options that aren’t listed by name. For example, if you click on 2,4-D you’ll get multiple pages that look like this. In the first column you get the type of filter and a model number. So then you have to do a search to find the name of that filter. It's really tedious and time consuming. You can also use the list of Water Quality Association certified water filters to find the best one for you. This list is easier to navigate. You can click on Show Models to see brand names and the contaminants they remove. Another option is, once you’ve decided on the type of water filter system you want, visit a site like Amazon and search for the different brand options. 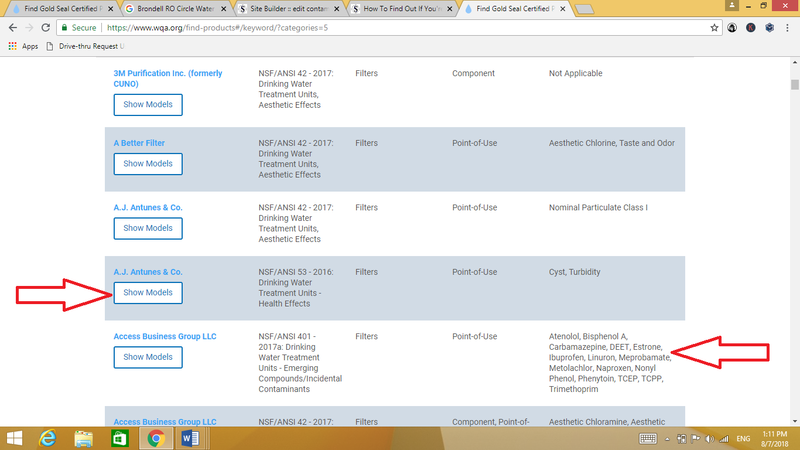 Then visit the websites of these brands to find a list of contaminants that are removed by the filter. Compare their list to the list of the contaminants in your water that you made. If you don't find a list, you don't want that brand. Finally, you can also check out these articles – Common Tap Water Toxins and The Filters That Remove Them and The Best Sink Water Filters. Click here for information on water filters that remove arsenic and here for the best countertop water filters. As a starting point here are some of my picks for filters that are great at cleaning up contaminated water. Filters produce 100 gallons of water each. Filters and pitchers made in the US. Independently tested in EPA-accredited labs to meet and exceed NSF Standards for contaminant reduction. The Berkey is easy to use and the system is stainless steel. Each filter is good for 3,000 gallons. So a two-filter system will filter 6,000 gallons. If they get clogged scrub them with a brush to unclog. eSpring removes over 160 different water contaminants. It is NSF-certified to treat contaminants of Aesthetic Concern (Std 42), contaminants of Health Concern (Std. 53), and Emerging Contaminants/Incidental Compounds (Std 401). But, it doesn’t remove arsenic. If arsenic is a problem in your drinking water the MultiPure is a better option. MultiPure water filters remove over 100 different water contaminants. Both the Multipure Aquadome and the Aquaversa NSF-certified to treat contaminants of Aesthetic Concern (Std 42), contaminants of Health Concern (Std. 53), and Emerging Contaminants/Incidental Compounds (Std 401). 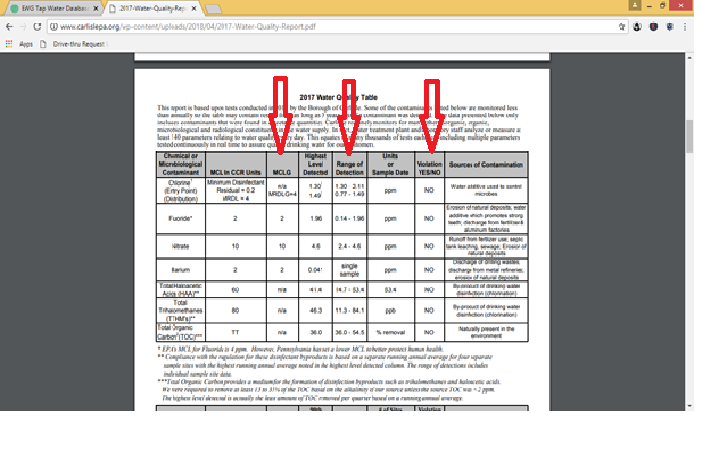 Multipure is the best option if PFOA/PFOS is a problem in your drinking water. The Epic Smart is NSF certified for numerous contaminants, over 70, reasonably priced, made in the US, easy to install. Easy to install but expensive. Filters last up to 15 months. Removes more contaminates than most under sink options, over 220. You can ind a list of contaminates it removes here.